You may remember the Granny Rose Afghan from about a bazillion posts this year. Well, so, you know what happened once that project was done? in addition to a few extra roses and granny squares. Pattern for the rose granny squares can be purchased on Etsy here. 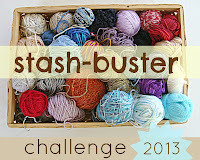 How about a couple of pillows to bust that stash? but in the mean time I will make a couple of more pillows. Crocheted a front and back. with that infamous picot stitch I use everywhere. Utilized button stash for opening. and thought "Astri could use this for a rag rug or something", and gave it to me! I know.... it's a sewing machine! Stuffed with fiberfill leftover from another 2012 project. A little lumpy, but once placed in it's cover, you'll never know. See not so lumpy anymore, huh? One with one rose and lots of trim. And one with four roses and little trim. that I am so fond of. Stash-busting low-cost guest room accouterments. Whew, that was a long post. Perhaps it should have been divided into two posts: one for each pillow. that I will be excited to show you soon. Also, be sure to check out the "CAL" tab at the top of the blog for two new entries by Linda and Melissa. Magnifiques coussins, et félicitations car coudre un cœur n'est pas simple du tout. Cela rend très, très bien. C'est joli tout plein !! Je trouve que les petits boutons pour ouvrir la taie du coussin c'est très précieux, charmant, et du travail en plus !! Je suis déjà impatiente de voir les nouveaux projets : couleurs différentes, pas de roses, mais qu'est-ce ???? Thank you CJ! The headbands you made with the roses are adorable. I really enjoy your blog and all the Spring things you have there now. A lovely weekend to you! You are awesome Kim! I hope you have as many pinned items for the future that I do. hehe. So much fun to be had by all out there on pinterest, huh? Thank you for always dropping by and leaving such sweet comments. So lovely. i realy love the heart pillow. i am looping forward to try the pattern. i must be patiënt grrrrrrrrrr. That makes me laugh...I now that feeling...grrrrrrrr....! I love your pillows and blanket. They turned out great. oh I LOVE the colors! Those pillows are just too cute! Well done Astri! I do not know which I love more, your new pillows or your guest room..Wow! How a happy room. Love it. I love the new "accent" pillows to that gorgeous guest room! Looks so cozy and welcoming. I have not made a pillow cover since junior high school. Makes me want to learn how to thread an old singer sewing machine given to me by my great aunt. I'm pondering the idea :) Thank you for more inspiration!! Hi Jen~ Your comment made me smile I was just thinking about that home economics class from junior high the other day when I was sewing this. I wished I had paid better attention to the sewing section. ;-) Your old sewing machine sounds awesome! Oh, so beautiful pillows for your colorful guestroom!! Gorgeous... colours and cushions great pics... Your work is amazing.. thankyou for sharing .. Thank you Pattas. I so enjoy your visits! Thanks for dropping a line, G.C. ! Thank you Ana. Your latest blankets are awesome as well! Lovely pillows, Astri ! :) I love the colourful things you make. Lovely new pillows and they saved additional stash. The guests at your home will be very comfortable. Just love both the pillow and the flowers..adorable! Yes, I am going to try to work on a pattern. It's an easy pattern once you know how to start the rounded part, it's just finding the time right now. Maybe this next week. -) I am obsessed with pillows too! That's fabulous, thank you! Writing up patterns takes a lot more time than one would think, as I have discovered. I love how versatile the granny roses are, and your stash-busting mission is very inspiring! :D Have a good Easter weekend! Thank you all so much for your comments. My heart swells with joy!